IBPS CLERK Mains 2017, the last exam of the year 2017 is going to held in 21.01.2018.There is only few days in our hands for preparation and you have to work hard to achieve your goal, because the competition is very high as per the vacancy is concerned. 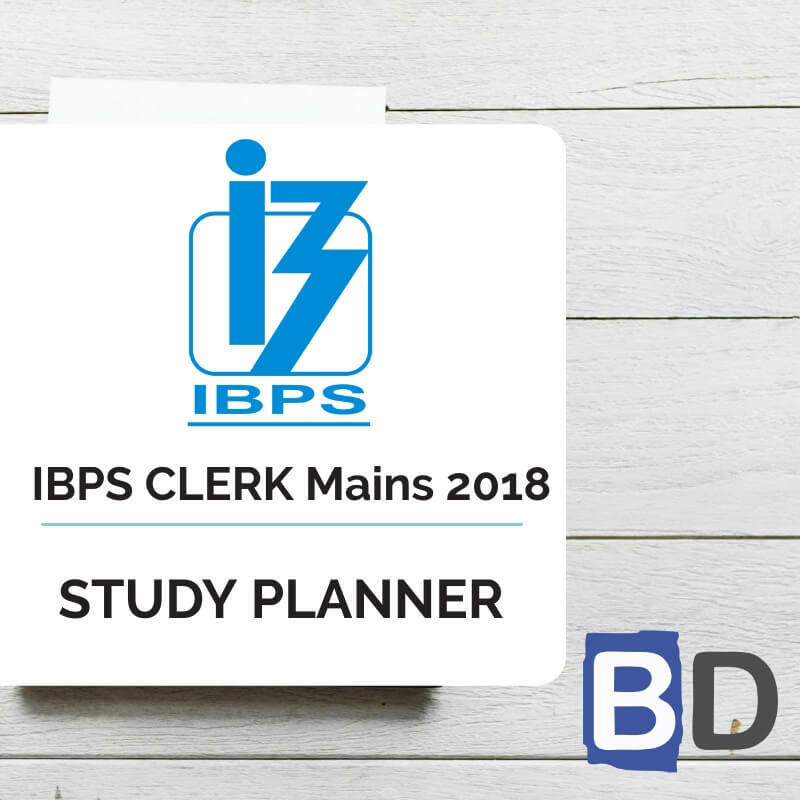 So start your preparation now with this study Planner for IBPS Clerk Mains. It’s a 20 days complete planner with various Aptitude, Reasoning, English, Current affairs & Static Gk topics Included. There are 4 Mock tests available in this planner. We have planned this Planner in Such a way that this will cover the entire current affairs quiz from the month of October to January (1st week). Because Banking Awareness, Current Affairs, Static Gk & Computer Awareness will play a vital role in cracking the IBPS Clerk Mains exam. Though the exam is getting tougher and tougher for each and every Year, Only consistently hard working candidates will crack the exam. So be a continuous hard worker and grab the opportunity to achieve your success. Try Try Untill you succeed!!!!!!!!!!! So as per the planner here is content related to English. D.1-8): Read the following passage carefully and answer the questions given below it. Of late, the media have been highlighting job losses in the IT industry and painting a gloomy picture ahead. Given the technology-driven nature of this sector, job roles constantly evolve. This means the workforce is on a perennial learning curve. And maintaining reasonable performance standard, along with up skilling and re-skilling, is essential to sustain and survive in such a business environment. Digital technology is everywhere today. Applications are used across a range of industries. So, the need for a skilled workforce in the emerging technologies will continue to rise, even as some of the existing ones need to fade away. Like any other industry that strives to be competitive, the IT industry also goes through performance-linked workforce realignments annually. This results in attrition of 0.5-2% of the workforce. This is healthy and ensures that the industry remains a lean, mean, fighting machine by reducing inefficiencies and remaining globally competitive. Mind you, these separations are performance-linked, not layoffs. There is no denying, however, that automation is nibbling away new recruitments. The IT industry is, indeed, hiring a shade lower than what has traditionally been the norm. The fact of the matter is that technology-led automation is no more an option but a necessity. But as a recent McKinsey study reveals, for every one million existing jobs that fall under the scythe of automation in the future, 1.9 million jobs will be created in the same timeframe. Beyond performance-based separations and automation, there are also issues including geopolitical shifts, disruptive technologies and new skill sets. Which is what makes rapid technology shifts, and the accompanying need for a workforce to arm itself with new skills, more challenging. Emerging technologies like the Internet of Things, virtual reality, big data analytics, artificial intelligence (AI), robotic process automation, 3D printing and cloud computing have brought disruption to many industries. The IT industry is also going through similar disruptions where digital technologies are helping to create newer roles where automation becomes the norm for low end, repetitive jobs. On the flip side, this leads to better-paid jobs. Technology disruption is also forcing people to acquire multidisciplinary skills. Some examples of newly emerged job roles: visual effects (VFX) artist, computer vision engineer, wireless network specialist, AI researcher, robotic process automation (RPA) developer, cloud architect, 3D engineer, language processing specialist and cyber security analyst. For most of these job roles, there is a shortage of skills in the market. The new workforce needs to get trained in these technologies and add them to their professional arsenal. A recent study concluded that only 25% of fresh engineering graduates in India are actually employable by any technology company. At the same time, a Nasscom study reckoned that 40% of the 3.7-million-strong IT workforce requires reskilling over the next five years to keep pace with emerging technologies and automation. To address the former challenge, the engineering curriculum and quality of education have to be significantly upgraded. To manage the latter, Nasscom is already working with many IT companies to re-skill nearly a million people. Technology is making it possible to learn anytime from anywhere. Industry has started adopting next-gen learning methodologies like gamification, flipped learning and augmented and mixed reality. New ideas and thoughts, like networked learning for instantaneous and contextual suggestions from peers, are being adopted to create a highly skilled and competitive workforce. While fresh graduates are picking up skills based on industry requirements, professionals with management profiles are also shifting towards product management. Employees with more than five years of experience, like project managers and mid-level executives, are taking up courses on machine learning, AI, micro service architectures and user interface/user experience. India’s IT industry has come a long way in creating a global technology brand. Along with the spice and diamond trades, IT has been the most successful industry in the country’s history. The industry will reinvent itself — it is reinventing itself — and one must recognise that side of the story. IT has been a cornerstone to the growth and prosperity of India’s middle class. And it will continue to help expand that base. By 2025, the IT industry is expected to double its employee strength to over seven million people directly, and over 10 million indirectly. A strong focus on skill development will help India walk through this tricky journey of digital transformation, so as to reach the destination of an increasing number of better-paid jobs that require more high-end skills. Which, in turn, will lift India’s IT Industrial Revolution 2.0 boat out of any low-end ‘conveyor belt production line’ sea. Q.1) Which of the following is described as ‘sea’ in accordance with the passage? b) The tricky journey of digital transformation. c) The abundance of jobs in the IT sector in future. Q.2) What is the projection for 2025 according to the passage? a) The employee strength in IT sector will be double-fold. b) The strength in IT sector is expected to be seven billion. c) The indirect offer of employment in the IT sector will be over 10 Million. d) Both (a) and (c). e) Both (a) and (b). a) The scythe of automation is not that much sharp. b) The proposed loss of job opportunities in the IT sector seems imaginary. c) The ratio of job creation to the loss of jobs in IT sector is roughly 2:1.
e) All (a), (b) and (c). Q.4) Rapid technology shifts overtake the IT sector because of which of the following? a) Geological shifts, disruptive technologies and presumptive skill sets. b) Geopolitical shifts, disruptive technologies and new skill sets. c) Constructive technologies, political shifts and new skill sets. d) Routine skill sets, abnormal political shifts and dangerous technologies. e) None of the above. Q.5) Technology disruption will result in which of the following, according to the passage? a) Decline in profit of the IT companies. b) Decline in the quality of output of IT companies. c) Forcing people to acquire multidisciplinary skills. d) Prosperity of India’s middle class. e) Closure of IT companies. a) IT job roles constantly evolve and there is a compulsion of the part of the employees to learn and be updated. b) IT job roles are such that constant and continuous learning will keep the employees on tenterhooks. c) IT job roles make the employees on a curve where the learning potential is high. d) IT workforce is on a perennial learning curve that the IT job roles are modified too often. Q.7) A recent study concluded that only 25% of fresh engineering graduates in India are actually employable by any technology company-Which of the following remedies is suggested by the author to tackle this problem? a) Facilities in the Engineering Colleges are to be upgraded. b) The engineering curriculum and quality of education have to be significantly upgraded. c) Flipped learning methodology is to be implemented. Q.8) Which of the following would be a suitable title to the passage? d) Auto Correction After Automation. D.9-15): Read the following passage carefully and answer the questions given below it. Certain words/phrases are given in bold to help you locate them while answering some of the questions. The Narendra Modi government’s stand on foreign investment is bewildering. On the one hand, it rolls out the red carpet to foreign capital under ‘Make in India’. On the other, it reduces legal protection for foreign investors. The reported expiration of India’s bilateral investment treaty (BIT) with the Netherlands on November 30, due to India unilaterally terminating the treaty, is a classic example. India has also issued notices to around 50 countries to terminate BITs, which includes about 20 European Union (EU) member countries. These will come into force soon. These treaties play a critical role in protecting foreign investment by holding host states accountable for the exercise of their regulatory power through an independent international arbitration mechanism, thus furthering international rule of law. BITs involve a certain degree of trade-off between protecting foreign investment and preserving the host state’s regulatory power. The narrative on BITs in India has oscillated from one extreme to the other. From 1994 to 2011, India signed 70-odd BITs tilted heavily in favour of investment protection against the host state’s regulatory power. Instead of correcting this laissez-faire narrative by balancing investment protection and the state’s regulatory power, the pendulum has now swung to the other extreme. The recently adopted Indian model BIT tilts the balance towards the host state’s regulatory power by severely limiting the substantive and procedural protection to foreign investment. India’s BIT loss to White Industries, an Australian investor, in 2011 and a slew of BIT cases slapped by many foreign corporations triggered this protectionist narrative. The recent loss in the Devas multimedia case under the India-Mauritius BIT, which arose on account of the cancellation of the Antrix-Devas deal, has strengthened this narrative. This is problematic in terms of protection of investment in India and Indian investment abroad. Termination of BITs by India will not impact existing foreign investment in India because most Indian BITs contain survival clauses ensuring availability of treaty protection for existing investment even after the expiration of the treaty for the next 10 to 15 years. Termination of BITs will also not impact any of the 15-odd ongoing BIT disputes against India including Vodafone’s challenge of retrospective taxation under the India-Netherlands BIT. Nevertheless, termination of BITs means that new foreign investment, such as any new Dutch investment in India made after November 30 shall not enjoy treaty protection. This shows India’s reluctance to be held accountable for its regulation under international law, thus forcing foreign investors to rely entirely on domestic laws and domestic courts to safeguard their interest. This may not be an attractive proposition for foreign investors for two reasons. First, if domestic laws are changed suddenly to the detriment of foreign investors, like it happened in the case of Vodafone where Parliament retrospectively amended the Income Tax Act to overrule the Supreme Court’s decision in favour of Vodafone, it would leave the foreign investor without any remedy. Second, the overstretched Indian judicial system does not inspire much confidence in foreign investors as a forum for speedy resolution of disputes. Subsequent to termination, India plans to launch new BIT negotiations with these 50-odd countries based on its 2015 model BIT. For example, with respect to EU countries, India hopes to replace the cluster of European BITs with the India-EU Bilateral Trade and Investment Agreement (BTIA), However, international treaty negotiations take time. The India-EU BTIA, despite 16 rounds of negotiations since 2007, has not been signed due to major differences. Unilateral termination of BITs by India has not gone down well with the EU, which means even further delay in BTIA obligations. Brexit has complicated things even more. The legal vacuum created would surely dampen investor sentiment, especially because there is far too much state interference in businesses in India that make the country a difficult place to do business. India’s rank in World Bank’s ease of doing business is abysmal at 130 out of 190 nations. When it comes to specific factors that are critical for foreign investors, such as enforcing contracts, India’s rank is even worse at 172. Moreover, major countries that export capital to India are unhappy with the protectionist template of India’s new model BIT as the basis to negotiate the new treaty. Today, India is not just an importer but also an exporter of capital. India’s overseas FDI has increased from less than $1 billion in 2000-01 to more than $21 billion in 2015-16. Given the reciprocal nature of BITs, their termination followed by replacement with a protectionist treaty will also reduce the protection available to Indian companies abroad. The significance of BITs for Indian companies can be gauged from three recent instances. First, a few months back, an Indian investor, Flemingo Dutyfree Shop Private Limited (FDF) successfully sued Poland under the India-Poland BIT, winning damages of €17.9 million. The tribunal found that Poland, by illegally terminating a series of lease agreements enjoyed by FDF’s indirect Polish subsidiary, had expropriated FDF’s investment and denied fair and equitable treatment to it under the India-Poland BIT. Second, an Indian mining company, Indian Metals & Ferro Alloys Ltd. (IMFA), has sued Indonesia under the India-Indonesia BIT at the Permanent Court of Arbitration, The Hague, claiming $599 million in damages, for regulatory problems pertaining to the claimant’s coal mining permits. Third, in a newly surfaced challenge, an Indian investor has sued Macedonia under the India-Macedonia BIT for the alleged expropriation of mining concessions awarded to the Indian investor. Indian BITs should reconcile investment protection with the host state’s regulatory power and shun laissez-faire and protectionist narratives. For this, India needs to do three things: amend the protectionist 2015 model BIT so as to strike a balance between interests of investors and that of the host state, negotiate with existing BIT partners based on this balanced model, and withdraw the termination notices till the newly negotiated text is finalised for replacing the existing BIT. This would help India resurrect its image globally of a market economy based on rule of law, not arbitrariness and cronyism. Q.9) The concept of bilateral investment treaties is associated with which of the following? b) Regulatory powers of the host country being subjected to scrutiny by International Law. d) Global resurrection of the host country. Q.10) Which of the examples is shown as the second relating to the protection available to Indian companies abroad? b) An Indian investor in Macedonia. c) Indian Metals & Ferro Alloys Ltd.
a) A business environment conducive to foreign capital. b) Reduction of legal protection to foreign investors. c) Providing capital to foreign companies. d) Settling disputes relating to foreign companies in Indian Courts. a) Indian BITs should aim at a balance between the regulatory jurisdiction of the country and the protection of investment by the foreign companies and an attitude of wilful interference should be adopted and protectionist tendencies are to be given up. b) The goal of Indian BITs should be to have a striking balance between the regulatory jurisdiction of the country and the protection of investment by the foreign companies and an attitude of non-interference and giving up of protectionist tendencies. c) The aim of Indian BITs is to reconcile host country’s regulatory jurisdiction and investment protection for the foreign company and to seriously intervene to ensure protection-oriented principles. d) A reconciliation between investment protection with the host state’s regulatory power is necessary to keep the status quo and to maintain the supremacy of that regulatory power. Q.13) Which would help India resurrect its image globally of a market economy based on rule of law? a) Withdrawal of the termination notices for the time being. b) Amendment to the protectionist 2015 model BIT of India. c) Litigation with existing BIT partners based on the balanced model.